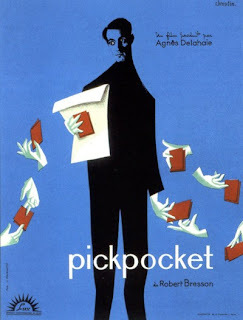 Robert Bresson's PICKPOCKET bears some surface similarities to the film noir genre – it's focus on crime, the use of first person narration, and a protagonist headed towards an inescapable fate. But rather than a traditional femme fatale, the object of desire here isn't a woman, but rather crime itself. Unemployed writer Michel (Martin LaSalle) ekes out a living by lifting wallets and watches from unsuspecting victims. He tries to justify his actions by claiming that a superior man should be allowed to ignore the law and prey on his inferiors when necessary to get by, but one senses even he doesn't really believe that. For starters, a life of crime is hardly the only option available to Michel; his friend Jaques (Pierre Leymarie) offers to help him find work. Others try to help Michel, too. Jeanne (Marika Green) is the pretty girl who lives next door to Michel's mother, and while she seems chiefly concerned with getting Michel to visit his ailing parent before she dies, its obvious her feelings extend beyond that. Even a police inspector (Jean Pélégri) who strongly suspects Michel seems reluctant to really go after the thief. But Michel is too much in love with the thrill of stealing to stop on his own. He does, however, seem to have a desire to get caught. Maybe it's guilt, or maybe it's just another thrill to be experienced. Bresson is well known for making films that reflect his Catholic values, often with themes of redemption at their core. That's certainly the case here. Where modern “faith and values” films tend to hit audiences over the head with their messages, Bresson is tasteful and subtle. Rather than a sermon, he offers up a parable, and even those who don't share his faith can appreciate what the film is trying to say. As is the norm with Bresson's films, the acting is intentionally flat and unaffected. The film's visual style is fairly straight forward, although the scene where Michel and a pair of accomplices show off their skills is very precisely orchestrated. Despite being, at least on the surface, a “crime” film, there is no real violence or action. This just isn't that kind of film. Instead, the focus is almost always on the story and its themes, which are more than compelling enough on their own. 4 out of 4 stars.